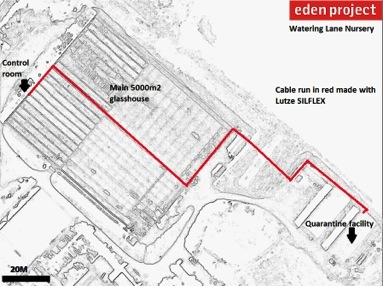 Lutze cables keeping Eden Project’s quarantined plants under control. 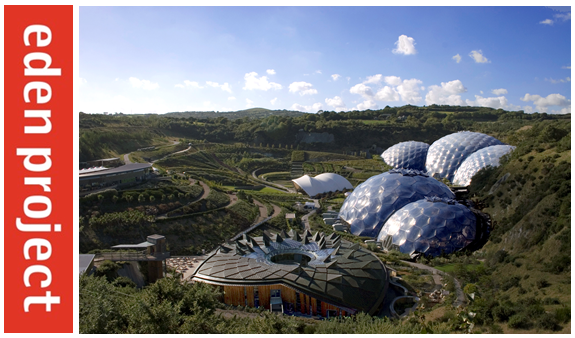 At the Eden Project, as well as maintaining all the mechanical plant on site, there is also the need to maintain the living plant displays in the biomes and surrounding areas. This is done mostly by growing new specimens from seed or cuttings, and sometimes buying in new plant material. Every seed/plant which comes to our nursery site is inspected for any unwanted pests or diseases, and depending on perceived risk, may be quarantined. All tropical material is quarantined for several months before it can join the main collections in order to eliminate the chance of a damaging pest outbreak in the biomes. 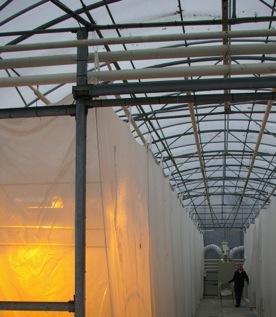 At the nursery there was initially a 2MW oil fired boiler which heated the main 5000m2 glasshouse, and also the physically remote quarantine houses. In 2009 this was replaced by a fully modulating gas boiler set 0-600kw, controlled by a custom programmed Priva BMS system and heated area reduced to 2000m2. At that time, the quarantine facility was not heated from the main system, but by a very basic local control gas air heater. In 2013 the basic gas air heater had deteriorated to such an extent in the warm moist conditions, that it was no longer economic to keep it in operation. 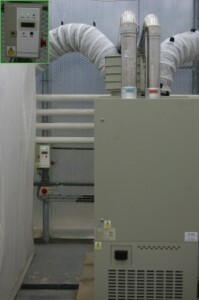 It was replaced by a sturdy LPG fired cabinet modulating air heater (36-72kw output) and linked to the BMS system. Michael Cutler, Horticultural Technical Engineer at Eden Project explains, “In order to control the heater we needed to run control cables all the way back to the control room and pick up the BMS wiring. 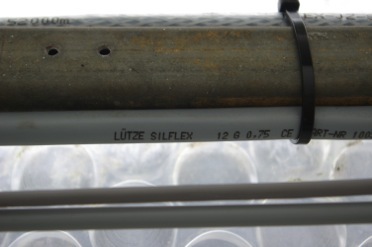 To ensure the best chance of reliability of operation for this heater, we installed a good quality branded cable – 200metres of Lütze Silflex 12C, 0.75mm2, YY. The 12 cores enable: control of the relays which activate the fan and enable heat output, modulation level 0-20mA, and supply/return duct temperatures, and lock out signal. We also used 3C, 2.5mm2, CY cable (also obtained from Lütze) to run power from the DB in at the quarantine house door to the heater and control panel. The cables were easy to work with, the outer jacket stripped nicely without sticking to the cores, the individual cores was flexible enough to enable forming and wiring into DIN rail terminals, and the core numbers were easily identifiable. On top of that, prices were better than our hitherto existing suppliers, and customer service had been excellent. We would always consider using Lütze cables, where appropriate, for our projects or maintenance activities”. If you would like more information on Lutze cables, please contact us. Many thanks for viewing, please feel free to leave comments below!